for your boat to keep it out of the water. Pier 281 Marina currently has 4 boat lifts, with plans to expand to 4 more for 2017. Never scrub your boat’s hull again! Re-sale will increase with a shiny and clean hull; free of grime and scum - resulting in your boat looking new over the years. Our brand new lifts are 20,000lb 4 post lifts. Max size of vessel 15' beam by 40' long for lifts. Contact the office for additional details. 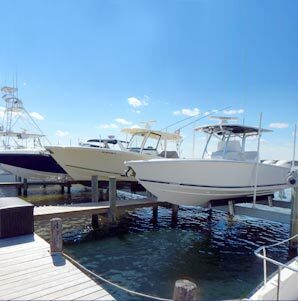 Additionally, we will customize the lift to fit your boat at an additional cost. Please call the office to discuss in further detail to see if this might be an option. Boat Lift Slips are $5,500 for the season. Call for details.